Recumbent bikology in the urban jungle. : There is HP Velotechnik, and then there's the rest. There is HP Velotechnik, and then there's the rest. I don't like to play favorites, but time and again, I'm amazed by the way HP Velotechnik pays attention to tiny but crucial details. They do a better job of wrapping bikes, than most. Here is a Street Machine Gte in the process of being unwrapped for final assembly. Almost every other bicycle manufacturer in the world could learn something from this photo. 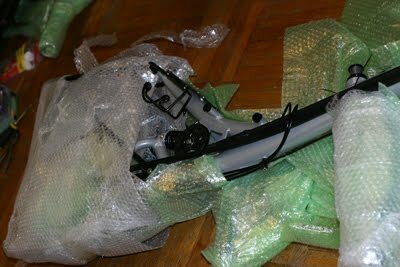 Of course you can clearly see this is a Scorpion fs about to be unpacked. Ain't nothin' getting scratched or dented or bent in that box. It's in the tiny things, where they really set themselves apart. Like, with a simple water bottle. 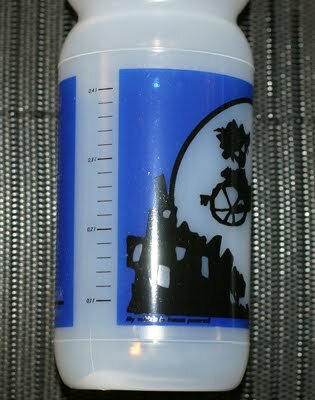 Friends, there are water bottles, and then there are HP Velotechnik Moonbiker water bottles. - It has two-color printing (not just one-color). - It is translucent, so you can see what's in it and how much remains. - The graphic is huge, covering most the water bottle (costs more, looks better). - It has milliliter markings on the side. Check it out. - And, of course, each water bottle arrives separately, and entirely, wrapped in a sheet of bubble wrap so you get it in perfect condition. Who else cares so deeply about the people who ride their bikes, and the quality of that experience, that they go to this kind of effort? Very few, my friends, very few.